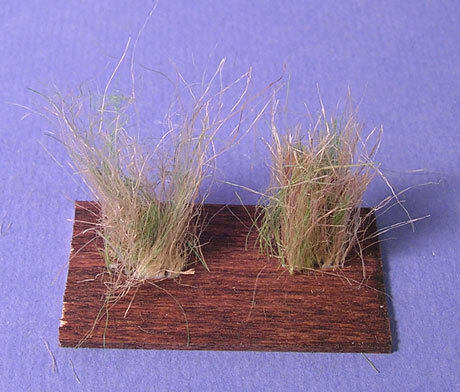 This tutorial is on how to create tall grass from 3 Ply Jute (aka Yute) from Darice Craft Designer (TM). I purchased this either at Michaels or JoAnn Fabrics. It’s been a while and frankly I can’t recall where it was. All I know is that it was cheap and I didn’t buy it for modeling purposes, but for a Halloween costume. First you’ll want to cut some 3″ pieces of the Jute and soak them in a grass-green wash of cheap acrylics (Apple Barrel, Liquitex, Americana, etc…) thinned with water. Soak for a minute or 2 then dry on some paper towels which will draw away the excess. This will give you green fibers later on. Now take a 3″ strand of the raw Jute and fray it out with a wire brush. Without removing the fibers from the brush split 1 of the 3-ply cords from the green Jute and fray that out. 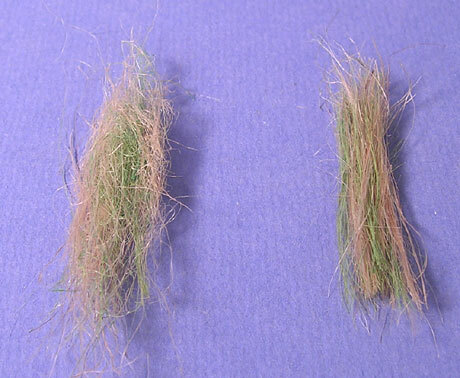 You’ll now have two potential bunches of grass. One neat bunch and one from the frayed brush-stuck material. Now fold each strand in half and using scissors, trim the bottom to be flat. You’ll have two clumps of grass now ready to be glued to the groundwork. The neat is good for the middle of a grassy area where the messy brush-gathered clumps work best as borders. 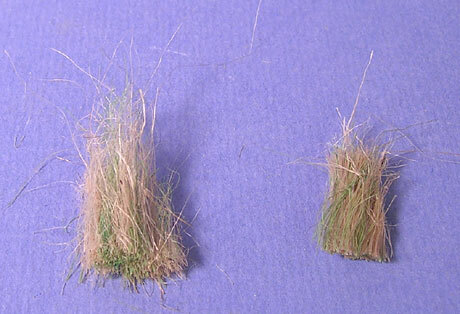 Hold a clump of grass in your hand and apply white glue to the flat trimmed underside. Press this onto the base and use some tweezers to pull the clump apart and slide it around a bit so that you don’t have a badhair plug-look, but a more natural random setting. Add the next clump as above and let dry. Once dry you can tease the grass and blend it into the adjacent clumps. You can also use scisors to trim longer straglers too. Mash down a little grass where it meats trails or the edge to hide the glued-down “roots” and to create a nicer more natural edge. 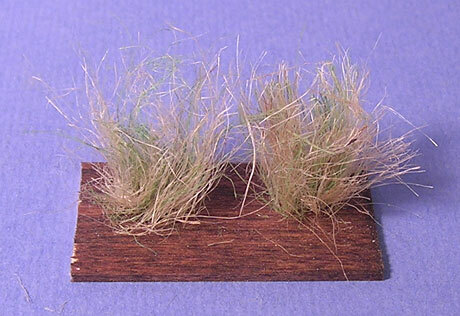 Below is this grass applied to the base for my KV-X2. You can use different lengths of clumps to get a nice random and natural effect. Be sure to blend the clumps together to avoid the bad hairplug look. 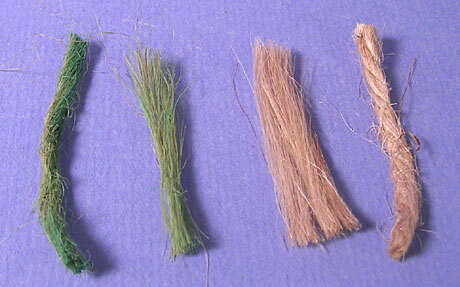 ^Above: Jute grass used in conjunction with Silflor grass and other natural materials to create a natural, random look. 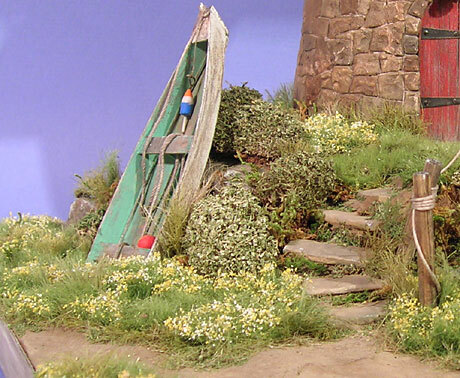 In that scene, far less natural colored Jute was used since it was for spring/summer. 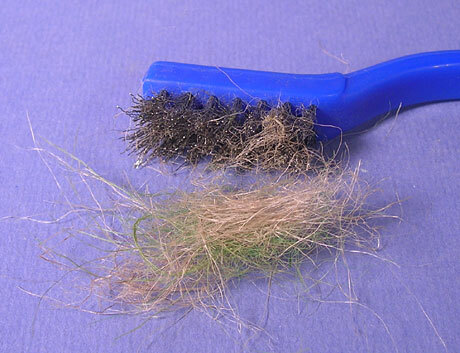 ^ Above: Jute grass as shown in this tutorial applied by itself for a grassy brush-strewn field in winter. 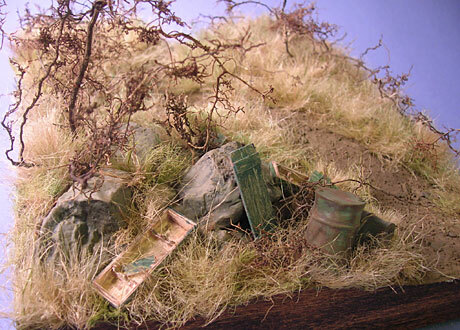 Diorama, Grass, Tips & Techniques, Tutorial. Bookmark. In Progress » KV-X2 to VICTORY!